Summertime is almost here, folks! That beautiful time of the year where everything feels fresh, people are out and about, and everybody wants to be active in the sunshine. It’s the favorite time of year for many people, and with good reason. If summertime had a smell it would probably be warmth. This is a very exciting time for parents since you are now able to take your family outside to enjoy the good weather and sunshine. For many children, these formative years are setting the stage for their attitude towards the outside world. There’s no bigger pride a parent can have than knowing that they’ve shaped their growing child into somebody who looks forward to being active. Naturally, this means it’s time to make it a good one! With all of the time kids are spending indoors these days it’s important for parents to stress how fun being outdoors can be. Exercise, for example, is something most parents want to encourage in the lives of their children. So, what’s one of the best forms of exercise that helps you get outside? Cycling! Riding bikes with your kiddo in tow is rewarding, exhilarating, and something everybody should try at least once. Who knows? Maybe it’ll become your new family tradition for sunny Sunday afternoons! It’s certainly a great way to round out the weekend. After all, there are so many benefits to having an active family. Keeping your kid on the move benefits not only their physical health but also their emotional and mental wellbeing. They learn how to think on the go, and quickly gain essential problem-solving skills that will continue to help them throughout life. Think of your house as the “safety zone”. This is absolutely true, and it should be! Kids need to know they have a stable place to come back to. However, keeping them in that “safety zone” all the time doesn’t do them any favors. Children who are sheltered rarely learn how to navigate through rough water (figuratively and literally!). They learn resilience, as well, and how it feels after a long day of work. Kids who are exposed to the outdoors early on also often experience fewer allergies since their bodies have long since figured out dander and pollen. If you suffer from a depression or anxiety that’s even more reason to start your child on the right foot. 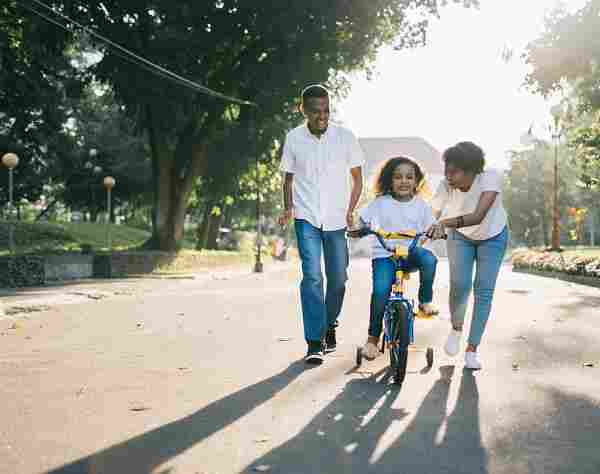 Initiating the ritual of daily activity will give kids a boost of the feel-good chemicals needed to combat the early onset of mental illness. This is true even more so for kiddos who might have conditions like ADHD. Although medication is a good route for children who need extra support, you should always combine this with high levels of activity. With so many benefits to be had, what are you waiting for? It’s time for you all to take a step into the wild! Maybe you’re worried about the process involved in figuring out how to safely cycle? That’s totally normal! Most parents have some basic worries when it comes to their child’s safety. It is a parents job, after all, to keep their babies out of harm’s way. Safety is for sure a priority on every parent’s mind. It’s okay to be a little skeptical about the safety of certain activities. 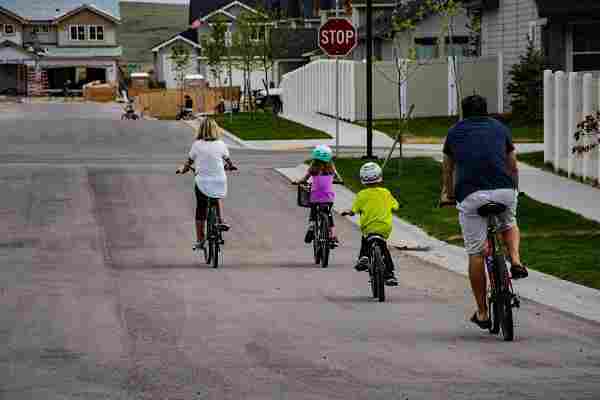 Whether you’re a newcomer to cycling, or truly a biking buff, we’re here to give you some tips on getting active with your child safely. We trust that after you’re through reading this article you’ll feel way more prepared. Never Fear Helmet Hair: Did you grow up in a time where helmets weren’t required and you turned out just fine? Most of us did! However, that doesn’t mean that it’s okay to skip that step for your own kids. Just because you got out of that time period unscathed doesn’t mean others were so lucky. Helmets are the number one protective layer against head trauma and are recommended by every association related to safety out there. There are a lot of reasons for this! Getting bonked on the head can result in some pretty devastating effects, some you might not even notice until things have gotten out of hand. It can be pretty scary stuff! – The helmet needs to fit properly as soon as it is out of the box. 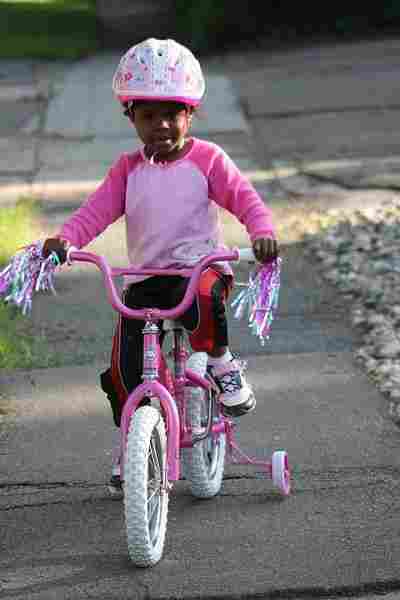 Do NOT buy a helmet that is too large for them to“grow into”, as this will not offer proper protection! One of the biggest mistakes you can make is having a helmet that doesn’t fit adequately. – Once you’re sure that the helmet is the correct size be sure that it also fits snugly to your child’s skull. Wiggle it around, and if it feels too loose, it probably is. Your helmet may come with “sizing pads” that can be inserted for a tighter fit if you need it. Note that the helmet shouldn’t be uncomfortable, but still tight enough that it doesn’t jostle around when you apply pressure to it..
Make sure that your child is equipped with this life-saving advancement every time you go out for a ride. It’s always better to be safe than sorry when it comes to the threat of traumatic brain injuries or, at worst, death. Remember, death is absolutely a possibility if you ride without a helmet. There is no question regarding that grim fact. So, be safe, and strap that helmet on. The Once-Over: Make sure that you check your equipment before you head out. Look for evidence especially of fraying on any straps used to secure items. Rust is also no-good, so be sure you don’t spot any on your equipment. Loose nuts and bolts, flat tires, and broken chains are more concerns on the list. They’re all pretty easily fixed, but you need to make sure you spot them before they’re a problem. Once you’re sure that everything checks out properly, you can move on to the next safety tip! Lights For Bikes: One of the best safety tips we can give you is to include lights on your bikes. These, even during the daytime, will increase your visibility tenfold. This is especially useful when you’re biking on trails where motor vehicles may be permitted. If you get caught out in the rain you’ll have less to worry about when it comes to visibility in bad weather, too. And, of course, this is an essential piece of any biking you may do from twilight to the early hours of the night. Keep Your Kiddo Close: No matter where you’re biking it is crucial that you keep your kiddo close. Accidents happen, but they can be better avoided when you don’t let your child wander off too far. 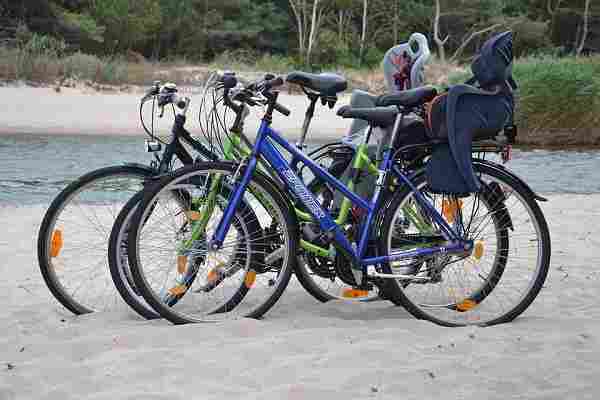 This can be avoided by attaching your bike to theirs, or by putting them in a bike seat. This, of course, depends on the age of your child as well as their activity level. We’re sure you’ll be able to figure out a system that’ll work for the both of you! Obey The Law: While this might seem a little obvious, we think you’d be surprised. A lot of beginner cyclists aren’t actually aware of basic road laws, for example. It’s largely important to brush up on your knowledge, even if you’re a seasoned veteran in the trade. Knowing who has the right away (although, normally it is cyclists) can mean the difference between life and death. You should also look into other safety features, such as mirrors or reflective vests. 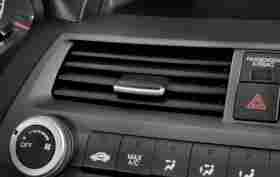 This will make you more visible to drivers, who will then be better able to defer to your presence. If you’re using a tag-along, which we’ll talk about below, then you are able to pack away a little more stuff. If you can get away with it you should try and bring a portable bike pump. This will help keep your tires in tip-top shape and avoid the disaster of an unfixable flat. You can buy small tire repair kits, as well, for repairs on the go. Those are also highly recommended by us! If you aren’t using a tag-along, then you can easily pack away your essentials in a compact backpack. It seems like a lot, but most of these suggested items are fairly small and lightweight. Try A Tag-Along: A lot of parents love being able to attach their child’s bike to their own! It gives you a sense of comfort knowing that your kid is close behind you at all times. You’ll never worry about anybody taking off, or being out of sight. Keeping your youngest child in a tag-along system can really help relieve some stress! A tag-along is simply a piece of equipment used to attach your child’s bike to yours. This can happen in several different forms, but the idea is the same across the board. There are several different methods of carrying your child with you, however. Each has their own set of pros and cons. We’ve compiled a short list detailing each common method and their best, and worst, feature. Trailer: This is an attachment that hooks up to your bike. It is generally mostly enclosed and gives your child a safe view of the world around them. They’re best for younger kids, or toddlers. Pro: Offers great safety for your tyke. Con: Can get pretty heavy, and hard to haul. Seat: A seat is just what the name suggests. This is an aftermarket product which you equip right behind your own seat. You can successfully use this for most small children, and toddlers. Pro: Lightweight, and doesn’t increase the width, or length, of your bike. Con: If there is an accident your child could fall from a significant height. 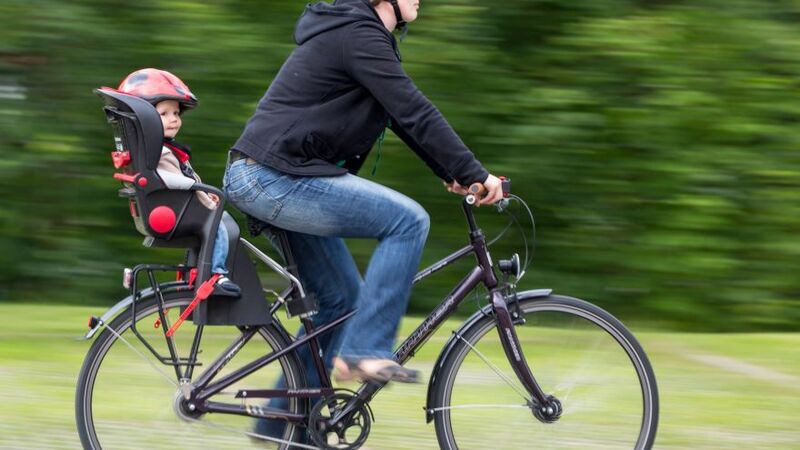 Tag-Along: A way to attach your bike to your child’s bike. Some people refer to trailers and tag-alongs as the same thing. In this instance, however, we’re talking specifically about the stricter definition of the term. 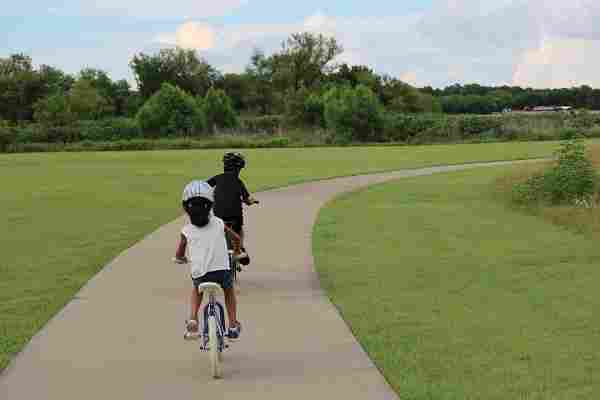 This mainly comes in the form of a full bike without the front wheel, which allows your child to peddle, as well, and have the full biking experience safely. Pro: Gives your child a sense of independence. Con: This method only works for older kids. We hope these safety tips are able to help you and your kiddo get outside and active! There is no better feeling than relaxing after a long day outside. You build muscle, better connections in the brain, and give your child a better start in life overall. Having a weekly, family workout also gives you some much-needed bonding time together. When you have that time set aside you’re able to make memories that will last a lifetime. Being able to fill your wall with photos of your smiling faces, alive with the delight that only nature brings, is a reward in of itself. You’ll cherish those lovely memories when your children are out of the house and having children of their own. So, what are you waiting for? With so many reasons to get out there and all the tips you need to be successful, it’s time to start cycling with your kiddo in tow!